Threshold Ramps are used around doorways to make transitions easier for wheelchairs and scooters. A good doorway ramp is a home feature that wheelchair and scooter users should not need to worry about. 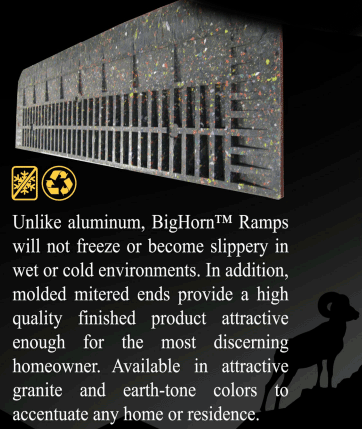 A quality threshold ramp that will hold up to weather, weight and constant use are the SafePath Bighorn Ramps. 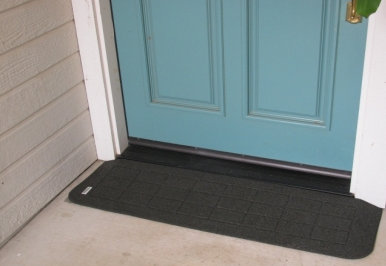 This residential Threshold Ramp adds a gradual rise to the doorway threshold that makes it easy and more convenient than many other model types. 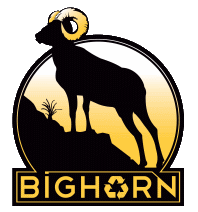 The Bighorn threshold ramps are made of recycled plastic and textured in such a way to create a surface grip to keep tires from slipping or spinning. Whether the ramp is in wet, cold, or any inclement weather, you can be rest assured the Wheelchair Ramp will maintain grip and not fade, crack or break. These risers will work for thresholds up to 1 1/2 inches in height. 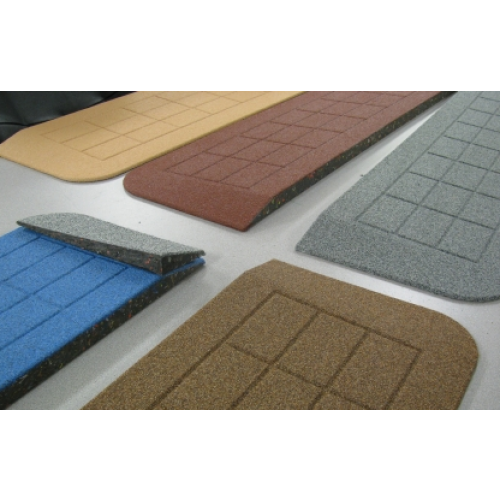 They come with molded traction pads that are not only functional as a non-slip ramp, but have an attractive geometric pattern. Their looks are also enhanced with a ceramic quartz surface that will blend in with the surrounding construction materials like stone, stucco or concrete. 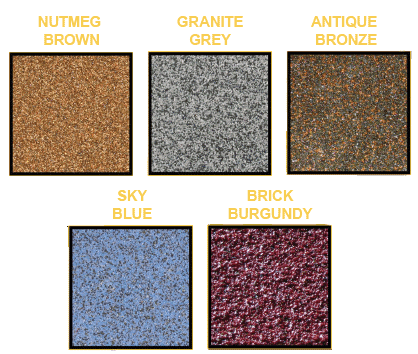 SafePath Bighorn Ramps come in four colors to match your home's entry: Nutmeg Brown, Granite Grey, Antique Bronze, Sky Blue and Brick Burgundy. 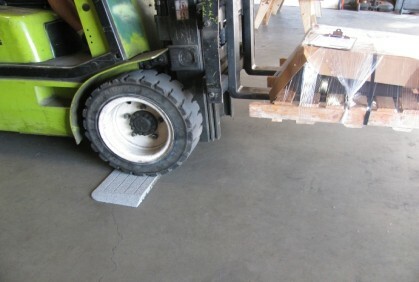 The threshold ramp will hold up to weather and use without cracking or breaking. The rise is has a nice, gradual incline to meet any threshold 1 1/2 inches in height. The traction maintains its effectiveness in cold, wet weather. 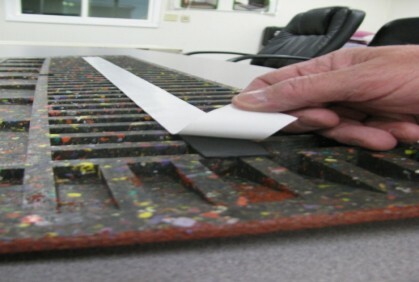 The threshold ramp is made of all recycled plastic material. 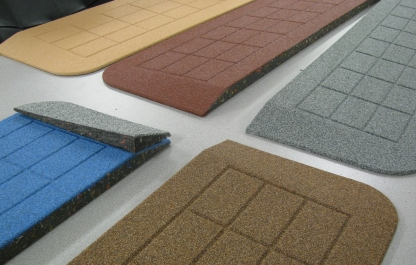 They have a ceramic coated quartz laminate and pleasing geometric traction pattern that is very attractive. 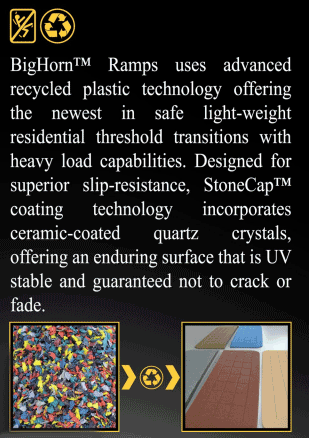 Product Press Release describes the advanced recycled plastic technology used to construct these durable wheelchair ramps. Product Instructions offer safe use information. 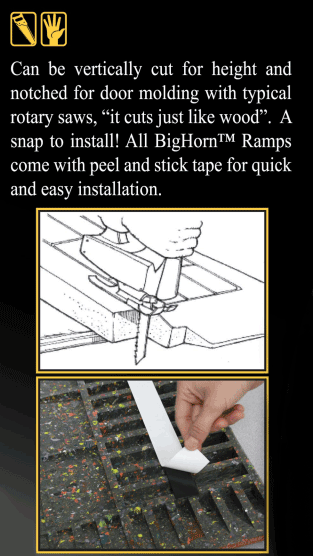 Product Brochure provides the advantageous this doorway ramp offers. After recently buying a new home, we found that both the front and back doors had 1.5” rises which were uncomfortable to cross with my power chair. We considered having a concrete contractor build the thresholds up, but were happy to find this inexpensive alternative online. The product works great for our needs, but at least the Antique Bronze color is not true to the swatch shown on the website. It is actually almost black! Having accessibility was more important than having a color which would blend well, so we didn’t try to exchange. Perhaps the best solution would have been to speak with a company rep prior to online purchase. Overall, happy with product. Shipping time was fantastic. I was glad to receive my ramp and when I put it in place it was just right. It makes my transition work with ease going through the doorway of my home entrance. My first ramp purchase and I really appreciate being able to have a color choice. Ramp is sturdy, wide as my front entry door, and stays in place when my power chair drives over it. I am a happy camper. if only it would fit electric wheel chairs for big men at the price I would order it today.